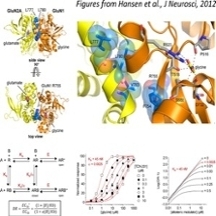 Recent faculty recruit to CBSD and the College of Health Professions and Biomedical Sciences, Kasper Hansen, successfully competed for a new NIH R01 award, “Structural and functional investigation of negative allosteric NMDA receptor modulation”, funded for $1.6 million over 5 years. Hansen was recruited to UM after a post-doctoral fellowship at Emory University, partially through faculty start-up funding from CBSD’s National Institutes of General Medical Science IdeA program Center of Biomolecular Research Excellence (CoBRE) Phase I grant. Hansen is also funded through CBSD’s CoBRE Phase II grant as a subproject PI. This funding supports his research endeavors focused on uncovering new regions of NMDA receptors that can be exploited for engineering of subunit-selective ligands, and provide mechanistic and structural insight to enable rational design of novel, clinically-relevant modulators that reduce GluN1 glycine site activity.